Archie: frist an Acid head then a bigamist! No wonder Archie Comics dropped the Comics Code before DC did. I’m sorry if Archie was on acid they would come up with a song better than yummy, yummy, yummy! Twenty-four hours later and I’m still laughing about this panel. 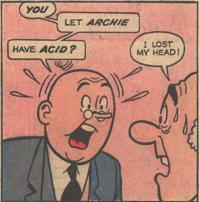 Archie was totally on acid. If “Sugar, Sugar” isn’t the result of acid I don’t know what is.